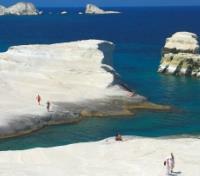 Stroll the moon-like beach of Sarakiniko on Milos with a private guide. 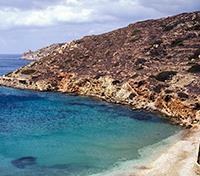 Swim the crystal-clear waters of the Aegean and stretch out on pristine beaches. Take a private tour of Byzantine and Venetian relics on Naxos, then sample citron liqueur at a local distillery. 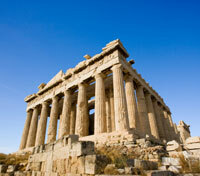 Discover the archaeological wonders of the Acropolis in Athens on a private walking tour. The Cyclades, a rough circle of islands in the Aegean Sea dotted with windmills and whitewashed villages, is world-famous for its natural beauty and vibrant nightlife. While Mykonos and Santorini get most of the attention, their lesser-explored-but-no-less-wondrous neighbors appeal to those seeking more peaceful escapes. The volcanic splendor, archaeological sites, and white-rock shores of rugged Milos enchant the curious; the narrow streets of Ios were built for slow strolls, and Naxos’ white wines and delicious liqueurs have enticed visitors for centuries. It should come as no surprise that these islands serve as the setting for so many Greek legends. But why settle for fables when you could write your own story? Please note: This itinerary is only available from June through early September, annually. Enjoy an airport transfer with a driver and assistant. For your added comfort, your representative will help you to co-ordinate meeting up with your private driver and accompany you to your accommodation. A welcome package with a city map, ferry tickets (if relevant), and any other touristic information that we deem you may find useful will be waiting for you upon your arrival at your first hotel on your trip. The Electra Palace Hotel in Athens is a stately and aristocratic hospitable presence centrally located in the heart of Athens and the old town of Plaka. Located within walking distance of the Acropolis and most major historical sites, as well as the business and commercial districts, the hotel is a luxurious retreat. Enjoy commanding views of the Acropolis from the rooftop restaurant and pool. Guest can dine at the "Motivo" restaurant, the "Electra" Roof garden restaurant, and the traditional English style "Duck-Tail" bar with its beautiful garden. The Electra Palace Hotel also hosts a wellness area, an outdoor swimming pool with Jacuzzi and pool bar, an underground parking and a business center. Meet your private driver and English-speaking guide for a full day private tour of Athens. Antiquity’s well-preserved sights mingle with a thriving, modern city, and the striking contrasts make Athens a fascinating city. Start with a visit to the city center to see the exterior architecture of the Constitution Square, the House of Parliament, the Memorial to the Unknown Soldier, and the National Library. Continue your drive to the Acropolis, passing by Hadrian’s Arch. Stop for a visit to the Temple of Olympian Zeus and the Panathenaic Stadium across the street, where the first Olympic Games of the modern era were held in 1896. Next, spend some time exploring the UNESCO World Heritage Site of the Acropolis, the ancient citadel located on a rocky outcrop overlooking the city. Discover the architectural masterpieces of the Golden Age of Athens: the Propylaea, the Temple of Athena Nike, the Erechtheion, and its most famous ancient monument, the iconic Parthenon. Break for lunch (not included), and in the afternoon, enjoy a scenic drive along the coastal road overlooking the Saronic Gulf, driving through some of Athens' most picturesque suburbs, including Glyfada, Vouliagmeni, and Varkiza on the way to Cape Sounion. Visit the remains of the Ancient Greek Temple of Poseidon, one of the major archeological monuments of the Golden Age, offering breathtaking panoramic views of the sea and surrounding islands. The temple dates to the same period as the Acropolis in nearby Athens and features a portico with Doric columns set on a cliff. 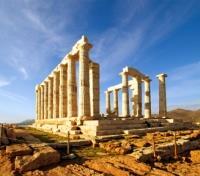 After visiting the Temple of Poseidon, there will be time to explore the rocky promontory of Sounion. At the end of the visit, return to your hotel by private vehicle. Meet your driver for a private port transfer. Board a high-speed ferry for a transfer from Athens to Milos Island. Approximate ferry duration is 3 hours. Meet your private driver and transportation for a port transfer. Situated on a picturesque hill, just a kilometer away from the port town of Adamas, the Santa Maria Luxury Suites blends elegance with the traditional architecture of Milos island. The modern and minimalistic décor of the suites’ interior, along with the breathtaking views from the private terraces create an ambiance of relaxation and tranquility. 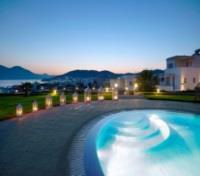 The hotel features a breakfast terrace, a relaxing pool area with a breathtaking view of the beautiful Gulf of Milos. Explore the fascinating volcanic island of Milos, whose geological setting served as a backdrop to the emergence of early Christianity. Meet with your private guide and driver, and begin with a visit to Papafragas Beach to gave upon the clear turquoise waters. The network of caves at the bottom of the ravine is a popular snorkeling spot for adventure seekers and makes for a memorable sight. 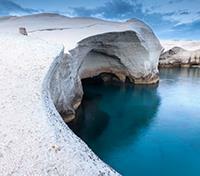 Continue to Sarakiniko, a stunning inlet of pure white rock formations sculpted by volcanic eruptions. This beautiful spot has an otherworldly feel to it, and the geological wonder is one of the most photographed places in the Cyclades. Walk along the inlet to experience this one-of-a-kind natural beach and capture some unique photos reminiscent of landing on the moon. Continue along the island’s northern cost towards the picturesque town of Plaka, known for its cobblestone streets and alleys. 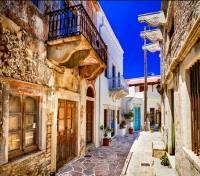 The town is built in the classic Cycladic “Chora” style with white stone houses and bougainvillea flowers. Stroll through the village at a relaxed pace to admire its traditional architecture and stunning views of the sea from Panagia Korfiatissa Church. Next, head to the outskirts of Trypiti to visit the Catacombs of Milos. A sacred place for early Christianity, the Necropolis was the final resting place to an estimated 2500 souls and doubled as a place of worship and refuge for early Christians fleeing persecution by the Romans. Close to the Catacombs, the Roman ruins of the Ancient Theater on Milos can be found. 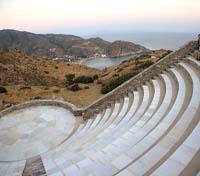 The amphitheater continues to host cultural events on the island to this day. End your tour by visiting the site of the discovery of Venus de Milo in 1820 – now part of the Louvre’s collection in Paris. At the end of the tour, return to your hotel by private vehicle. Enjoy a leisurely day in Milos today with no planned activities. The southwesternmost island of the Cyclades is volcanic in origin, and hot sulfurous springs can be found along the eastern shore of the harbor. Explore the island at a leisurely pace - there are 70 beaches along its shores to discover at your own pace, with Sarakiniko offering particularly beautiful lunar landscapes. You may also wish to relax and enjoy the amenities at your hotel today. Board a high-speed ferry for a transfer from Milos Island to Ios. Approximate transfer time is 3 to 4 hours. Dionysos Seaside Resort is situated in a quiet, unspoiled location overlooking the breathtaking Mylopotas beach only 5 km away from Ios port and 20 minutes’ walk from the island's capital. 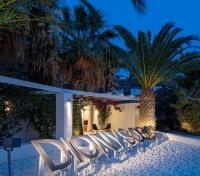 Maintaining a balance between an intimate island family hotel and a glamorous sea- side resort in Ios, Dionysos beach hotel is a real haven. 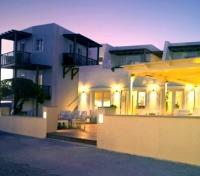 This 4-star property features elegantly decorated rooms, offering a view of the sea, pool or garden. The hotel also features a tennis court, two swimming pools, a beach bar and an a la carte restaurant. 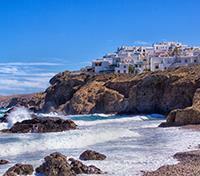 Ios is a quaint Cycladian island lined with beautiful ports, beaches and villages perfect for exploring. Meet your private driver and guide at your hotel and spend a half day exploring this picturesque island, beginning with a stroll along the beautiful port of Yialos and see the 17th-century Agia Irini chapel. From here, head along the path to Valmas and Kolisani, two small and remote sandy beaches. From the port area, make your way to the old town of Chora, a quaint town featuring iconic flat-roofed houses along narrow stone-paved streets. Spend some time wandering the streets and explore the town’s lively markets, restaurants and bars. Continue to the cliff top Greek Orthodox church Panagia Gremiotissa. The church is the highest spot in the village and visible throughout the entire town of Chora. End with a visit to nearby Mylopotas beach, for a laid-back time lounging on the sand, or swim in the azure waters. Return to your hotel by private vehicle at the end of the tour. The dramatic cliffside backdrop overlooking the sea of the island of Ios is the perfect setting for a relaxing day at leisure. Stroll through the Cycladic villages and meander narrow pathways of stairs through an enticing selection of restaurants, boutiques, bars, and nightclubs. 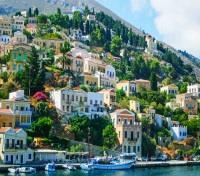 The island is particularly well-known in Greece for its savory local cheeses, and connection to the ancient Greek poet Homer. Spend the day exploring the idyllic golden sand beaches set against cerulean waters at a leisurely pace, with no activities scheduled for today. Board a high-speed ferry for a transfer from Ios to Naxos. Approximate transfer time is 1 hour. The Nissaki Beach Hotel, built upon the seashore of Saint George Beach and only minutes away from the picturesque, cosmopolitan town of Chora, Naxos, is an impressive site at first glance. The blend of luxury class and relaxation along with the privileged and magical view of the crystal clear blue waters of the Aegean Sea, and the heartfelt hospitality of the hotel proprietors as well as the smiles of the experienced staff will make your vacation an unforgettable experience. 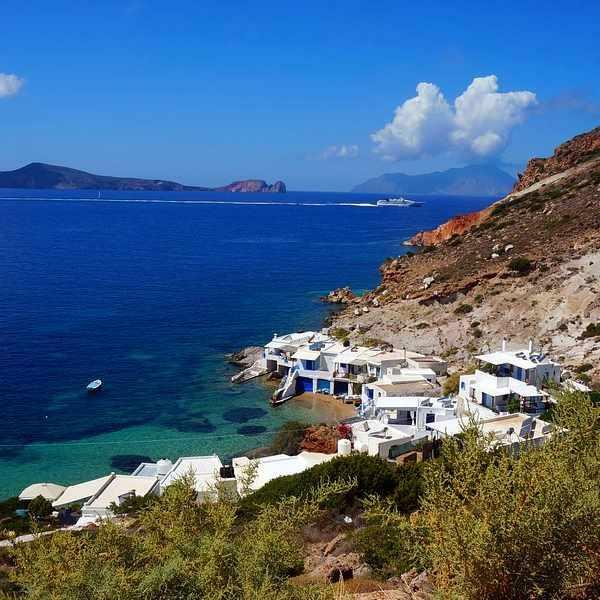 Explore the scenic small villages of Naxos, an island dotted with ancient monuments, Byzantine Churches, Venetian castles, and classical Greek ruins to compliment the dramatic coastline. Meet your private driver-guide at your hotel, and drive through colorful villages en route to picturesque Sangri. Here you'll explore the village’s ancient temple ruins dedicated to the goddess of the harvest and fertility of the earth, Demeter. Continue to the historic village of Chalkio to visit the Vallindra Kitron distillery to sample the island’s unique “Kitron” liqueur, made from the fruit and leaves of the local citron tree. From here, head to the village of Apeiranthos, perched precariously on the hilltop of Mount Fanari. The town commands spectacular views of the Naxian mountain range, and Venetian influence can be found in the town’s architecture. Take a break for an included lunch at a famous taverna in the traditional mountain village of Koronos, then continue through the rolling hills of Naxos to the fishing village of Apollonas set in a quiet cove in the northeast of the island where you'll visit the Kouros of Apollonas, also called the Colossus of Dionysus, an statue dedicated to the god Apollo which remains unfinished in an ancient quarry. End the day with a relaxing visit to an olive press in the village of Eggares to learn about olive oil fabrication, before returning to your hotel in Naxos. Enjoy a relaxing day at leisure with no scheduled activities today. 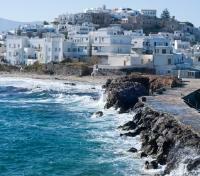 Naxos has a relaxed atmosphere, dotted with scenic beaches and ancient ruins. Spend the day exploring the island's selection of beaches, far from the crowds you'll see on other islands. The island boasts a bustling network of restaurants, cafes and quaint shops if you prefer some time away from the beach.